How cool is it that you can update your Facebook, Twitter, WordPress (and other social media profiles such as LinkedIn, Foursquare, PingFM, and Mixi) within seconds of each other at the same time?! Only in today’s social media landscape is this possible, and really fun. For those of you who don’t know, HootSuite is a social media management tool, allowing the user to post information on a plethora of different social media profiles at the same time! 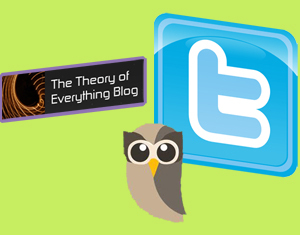 A couple of weeks ago, I started implementing social media techniques for a blog called The Theory Of Everything Blog through HootSuite. To begin, I added the site’s Twitter feed and Facebook wall to the stream mode in HootSuite. Although I know almost nothing about the cosmology, space, or cutting edge science mentioned in the site’s WordPress-hosted blog, I have begun expanding my social media horizons by bulk tweeting on @TOEblog and posting on Facebook for the site. I am using social media techniques that I have learned throughout my college career and picked up from sites and blogs like Mashable and Social Media Chemistry, which have taught me key words to include in tweets and Facebook posts, when to post information, and how to get users involved in your brand/website by posing questions and explaining interesting facts via tweets and posts. This is a learning experience for all of us, as I am just starting out on the brand new social media management circuit. I hope that I can deliver great results to this blog, and learn about social media in the process through HootSuite. Thanks for sharing this article. It’s always great to see how our owls are using the dashboard! Thanks, Andy and HootSuite, for giving me the social tools to learn!